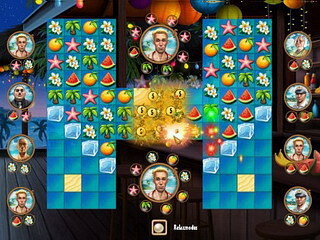 5 Star Rio Resort is is a newly released match-3 game that challenges your business skills (and matching skills too of course). As a bonus, you get to enjoy some gorgeous summer scenes until the summer still lasts! All the money that you make you try to reinvest to make the place a luxury resort by buying amenities like a bar, a swimming pool, a maintenance building etc. 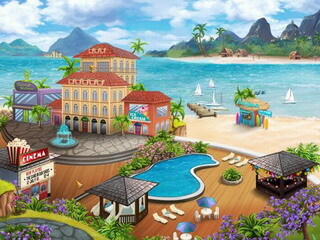 Playing 5 Star Rio Resort will either make you nostalgic of a vacation you already had or even more annoyed because of the one you didn’t have this year. Well maybe not, but you will enjoy this match-3 game. You play as Lucy, a daughter of a real estate tycoon. Sounds like your life should be all easy and nice, but not quite so! You need to prove capable of being and heir of this huge empire. And you do it by building your own resort on a very tight budget. And not just a resort – a five-star resort! So it is going to be a lot of strategy and hard work for you. You start by building a hotel and then you need to work on attracting new customers and keeping them entertained so that the money kept coming. All the money that you make you try to reinvest to make the place a luxury resort by buying amenities like a bar, a swimming pool, a maintenance building etc. Some buildings will give you a power-up to use on the tiles. You get an Orange Juice Bomb for the tiles when you match 4 or more tiles. As you build new buildings, you get to play a Solitaire game occasionally. Your tiles get blocks like chains, crates and ice cubes as well as chocolate that melts over surrounding tiles. You are going to have to learn what actions remove these and other obstacles on your board. Don’t be fooled by the few easy levels that you start with. It does get more challenging as you proceed. Check out this match-3 game under the palms while it is still summer! This is 5 Star Rio Resort review. Download this game here.